Blue Kep is a straightforward affair, with just five reasonably spacious bungalows buried in among vibrant gardens. Ad Book now! Rates from US$49++. Average rating 8.9 from 21 reviews. We kind of fell in love with this at first sight. The air-con rooms are high-ceilinged which creates real breathing space and they’re decorated in a simple, neat style, offering comfort for a price that’s hard to beat in Kep. Indeed few can beat it. The rooms and bathrooms are all scrupulously clean, with wide, comfortable beds and each bungalow has its own terrace .The owners, Chantal and Chris from Marseille, were super-friendly and could not have been more helpful. We actually felt sad to leave them, which doesn’t happen often. Not after half an hour. The main building has an open-air bar and restaurant upstairs, with views out to the sea. There were plenty of books and games lying around the restaurant, but if you’re feeling a little more sportive you could check out the pool table downstairs or the petanque pitch in the garden. They’re just a kilometre away from the crab market, and beach. 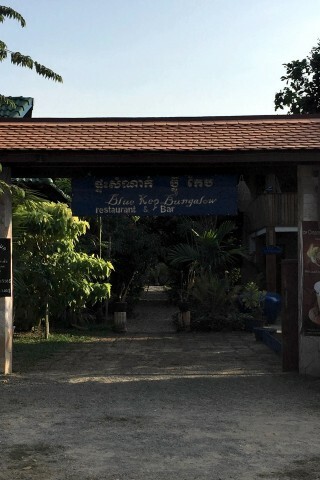 If you want to use a pool, Kep Lodge at the top of the road is easily accessible. Last updated on 8th March, 2016. Check rates at Blue Kep on Booking.com. Room: Family room, low season: US$45, high season US$45. Notes: Sleeps up to four. Where are you planning on heading to after Kep? Here are some spots commonly visited from here, or click here to see a full destination list for Cambodia.